Erie Canal Harbor Development Corporation (ECHDC) and Assemblyman Sean Ryan announced today that ECHDC has entered into an agreement with Griffis Sculpture Park to erect a major sculpture on Buffalo’s Outer Harbor. Flat Man, a 30-foot steel sculpture will be located on the Greenway Nature Trail near the water’s edge. The sculpture has recently been moved from Griffis Sculpture Park in East Otto, New York to Essex Art Center on Buffalo’s West Side to prepare it for installation. Work on the concrete base should begin the week of August 14th, and installation should be complete by the first week of September. Flat Man, created in 1963 by Larry Griffis Jr., is an iconic piece that originated at Griffis Sculpture Park, one of the first and largest sculpture parks in North America. The sculpture, standing almost three stories high and weighing close to 3,000 pounds has resided on the East Hill of Griffis Sculpture Park for over 51 years. One of the most loved features of the piece is the heart shape in the body which creates a message of love and inclusivity. The Flat Man sculpture was part of a large commission that included The Dancer, Round Man, Fecund Figures, Deserted, The Oracle and the Clown which were fabricated at a warehouse on Niagara Street prior to the purchase of the Essex Arts Center. 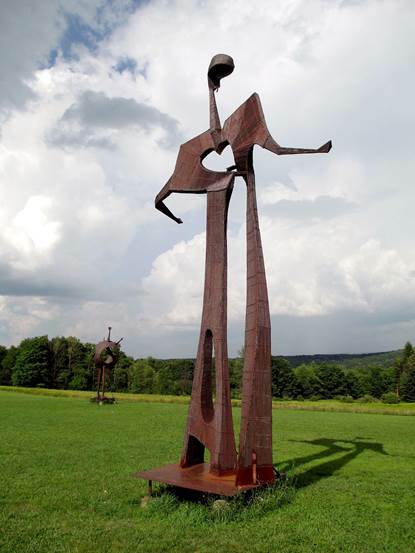 The sculptures were originally placed at Kissing Bridge but were moved in 1966 when The Ashford Hollow Foundation purchased 450 acres in East Otto, NY where they have stood as beacons welcoming visitors to the sculpture park. Flat Man will be on loan from Griffis for five years beginning this fall. The location allows the sculpture to be viewed by boats in the water, pedestrians on bike or foot and visitors at the Bell Slip. ECHDC is committed to supporting public art along the waterfront. Multiple art installations have become a popular and dynamic part of both Canalside and the Outer Harbor including the wind sculptures at Wilkeson Pointe, Shark Girl and the Silent Poets at Canalside and the Connecting Terminal Grain Elevator, the largest permanent light display to date. The Erie Canal Harbor Development Corporation (ECHDC) is governed by a nine-member board consisting of seven voting directors and two non-voting, ex-officio directors. The seven voting directors are recommended by the New York State Governor and are appointed by the New York State Urban Development Corporation d/b/a Empire State Development as sole shareholder of ECHDC. The two nonvoting, ex-officio director positions are held by the Erie County Executive and the City of Buffalo Mayor. For more information on ECHDC, visit: www.eriecanalharbor.com.